The indie smash hit Stardew Valley has finally made its debut on Android. The wholesome farming RPG allows you to plant crops, forage, raise animals, and even mine! However, while the game is not difficult to play, it's has its secrets. So to help you along your journey of building your dream farm, we've put together this list of tips and tricks for Stardew Valley's Android version. Let's saw the seeds of success! First a bit of history! Stardew Valley was first released on February 26, 2016 for PC and this is the version that gave the game its meteoric rise. Created almost singlehandedly by Eric Barone, Stardew Valley has won multiple games awards since, as well as made the jump on all major platforms, including the Play Store. However, we think the mobile version of the farming RPG might be the best yet, because it allows you to enjoy all of Stardew Valley's goodness on the go. So, if you're convinced to try it out but you're not sure where to get started, we've got you covered. For now, we will focus on tips for beginners, but we'll update the article with more advanced tips and tricks in the future. Stardew Valley begins with the good old character customization screen. But apart from picking quirky names and crazy hair colors for your character, you can choose between five farm maps: the Standard Farm, a River Land Farm, a Forest Farm, Hill-top Farm and a Wilderness Farm. All of them have unique layouts, as well as different benefits and drawbacks. However, if this is the first time you're playing the game, we recommend you stick to the Standard Farm layout. It has the highest number of tiles that can be transformed into farmable land or filled with buildings. It's the best choice while you're still figuring out how to manage your resources. The Wilderness Farm might look similar, but you can encounter monsters lurking in the dark. Don't be tempted by the River Land Farm either - it's best suited for a second playthrough after you've mastered the art of fishing. And that's not an easy task in Stardew Valley - trust us! What can a farmer expect to find in their inventory? A trusty hoe and a watering can of course! You will also find a pick axe, a scythe and axe, which you will need considering your grandfather's farm almost resembles a jungle when you first arrive. The tools are pretty self-explanatory - the hoe makes the ground ready for planting, the scythe clears weeds and grass, and so on. They don't have a durability, so you won't need to re-craft them. In the mobile version of Stardew Valley the inventory is conveniently placed on the left-hand side, so you can easily maneuver with the touch controls. However, the number of slots initially available remains the same - just twelve. Once you start foraging and clearing out paths, you will quickly find out that it's not enough for anything! So, what can you do? You will need to purchase a Large Pack from Pierre's shop. It will double your space to twenty-four slots, but it doesn't come cheap. Working at a soulless corporation before moving to Pelican Town has only netted you 500 gold. While that seem like a solid amount of cash at first glance, the inventory upgrade costs 2000. So, plant some crops and start saving up for that luxurious backpack. The tools can also be upgraded up to four times, becoming more efficient with each upgrade, but that also requires bags and bags of gold, as well as rare ores. For now, we recommend focusing on the basics. One of the most important ones is energy. You can't be ploughing the fields and sowing seeds all day and night! The meter with a helpful E above it is your energy bar. You start off with 270 maximum points, which can later be upgraded with Stardrops (34 for each consumed). If you push yourself too hard and the bar drops to 0, your movement speed will slow to crawl. If you are still trying to be productive after that point, your character will simply pass out, ending the day. The same will happen every day at 02:00 AM in-game time. This will also result in lower energy at the beginning of the next day. Of course, you can replenish it by eating and sleeping. One way in which Stardew Valley differs from real life, however, is that if you go to bed before midnight your energy is almost always fully restored. This means that as long as you manage your time, you don't really have to eat at all. You can sell all of your beautiful organic crops for quite the profit instead. 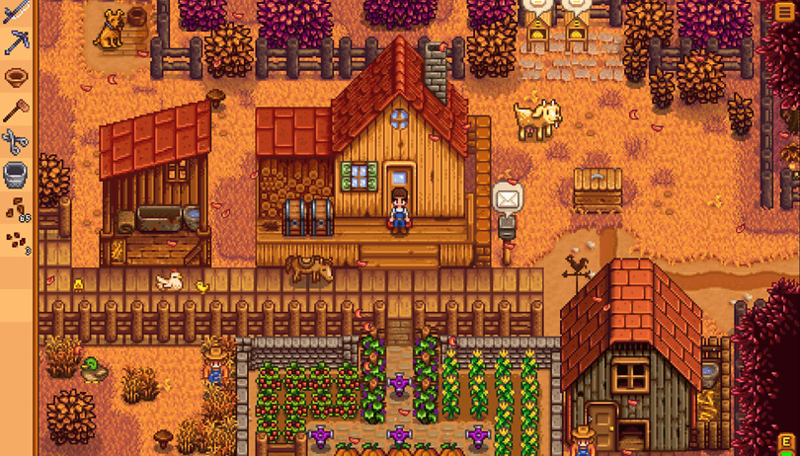 Stardew Valley also offers five skills you'll need to hone - Farming, Mining, Foraging, Fishing and Combat. Each can take you on a different 'carrier' path, which we will get into further soon. When you arrive, you will be greeted by town mayor Lewis and carpenter Robin. You will receive a gift of 15 parsnip seeds, which we recommend you plant right away (you will need to clear out some space and hoe the ground first). Don't forget to check your mail box daily - it will have quests and surprises in store for you. One of your first tasks is to meet the locals and make some new friends. So, the best advise we can give you is to explore! Head on the path west of your house and you will soon end up at Pierre's General Store. There you will meet not only Pierre, who you can buy seeds and the backpack upgrade from, but also plenty of other colorful characters. If you head there in the early morning hours, with some luck you'd be able to meet around five characters just in the shop itself. Others will be harder to find - Sebastian is a reclusive and elusive character who prefers to stay in his room most of the time, while Elliott can usually be found on the beach near his house (head south from Pierre's). Additionally, a character with mysterious and maybe magical powers can be found when you head south then east from your farm. The more you explore, the more secrets and more interesting characters you will meet. Talk to them until you exhaust their dialogue options. It's an RPG after all! When you feel like you've met enough characters, head back and start clearing out the space on your farm by slicing weeds with your scythe, cutting down trees and mining rocks. However, don't sell the wood and stone you gather. These resources are not worth much gold, but they can be very useful when crafting and later for building upgrades. Wood specifically can also be used to rebuild broken bridges. You will find one of them on the beach near Elliot's house. Restoring it should be one of your first priorities, since you can often find great foraging loot in the area it opens up - foraging will be your primary income source before you can start farming en masse. Speaking of farming, Stardew Valley has four seasons - spring, summer, autumn and winter. During each one you will only be able to plant certain types of crops. As expected, you need to water them daily to grow (unless it's raining). Just stop by Pierre's shop and stock up on new seeds at the beginning of every season. We will discuss which the most efficient and lucrative crops are in the next tips and tricks update, as well as talk about raising animals. Building pens for them costs quite a lot of money and resources and it shouldn't be a priority when you are first starting off the game. Another great tip, believe it or not, is to watch TV when you wake up for before going to bed. You can check the weather forecast, get farming and cooking tips, as well as your fortune. Trust us, the last one matters quite a lot. On day five of your farming adventure, you will be able to start mining, which we'll get into further in our next update of the guide, but let's just say that developer Barone was inspired by Minecraft. Becoming part of the Pelican Town community is an essential part of Stardew Valley. Every character has their own unique story - different struggles, goals and dreams. Even those that might seem shallow at first glance. This is why we won't reveal much about individual characters. It's something you should discover on your own. It's one of the best and most heartwarming parts of the experience. Flowers will be the most accessible in the early game, so if you don't need the extra money, gifting them is always a great idea. These are our beginner tips and tricks for Stardew Valley on Android. What should we include next? Do you want to know more about crops, animals or mining? Let us know in the comments below. Great 😊, my younger sister used to love playing Farming games when she was in her late childhood. But now she says they take a lot of time, have annoying inapp purchases and are distractive. These days I am playing Beach Buggy Racing 2, a very nice cart racing game. The game is very addictive, and quite challenging although it too has its cons. Try this game on pc, it's much better than a smartphone. I played over 6-8 hours straight every day. I've put a ton of hours into the PC version too, it's one of my favourite games. I have to say it's great on mobile too though. No in-app purchases, it's basically the same game. The only thing missing for now is multiplayer. Controls on mobile are also good, I have no complaints so far. Absolutely worth the $7.99.